This glossary includes terms commonly used when discussing or referring to maritime spatial planning (MSP) in general or certain aspects of the MSP process. The sources of the presented definitions are included at the bottom of this page. An overview of the key documents outlining what MSP is and how the process might be initiated and managed can be found on the Library page, along with a short Introduction to MSP. Adaptive management: a ‘systematic process for continually improving management policies and practices toward achieving articulated goals and objectives by learning from the outcomes of previously employed policies and practices. Active adaptive management is where management options are used as a deliberate experiment for the purpose of learning’. Areas Beyond National Jurisdiction (ABNJ): the overarching international legal framework for regulating activities in ABNJ is provided in UNCLOS, where ABNJ comprise areas 'beyond the limits of national jurisdictions, including ‘High Seas’ (water column beyond Exclusive Economic Zone (or beyond the Territorial Sea if no EEZ has been declared)) + ‘Area’ (seabed beyond the limits of the continental shelf)'. Blue Economy: the ‘sum of economic activities of ocean-based industries and the assets, goods and services of marine ecosystems’. Alternatively, the blue economy / ocean economy refers to the ‘sustainable use of ocean resources for economic growth, improved livelihood and jobs, and ocean ecosystem health’. Blue Energy: all technologies to harvest the renewable energy of seas and oceans other than offshore wind, such as wave, tidal stream, tidal range, ocean thermal or salinity gradient energy. Blue Growth: the ‘long-term strategy to support sustainable growth in the marine and maritime sectors as a whole, recognising oceans as drivers for the European economy with great potential for innovation and growth’. Blue Growth is the European Commission’s initiative to further harness the potential of European oceans, seas and coasts for jobs, value and sustainability. There are five sectors with high potential for sustainable blue growth, including renewable energy, biotechnology, coastal and maritime tourism, aquaculture and mineral resources. Competent authority: the ‘authority or authorities competent for the implementation of the Maritime Spatial Planning Directive, as indicated to the European Commission by the Member State’. Ecosystem-based approach: a ‘holistic approach with a focus on preserving/restoring marine ecosystems and maintaining ecosystem services to support human needs. It should provide spatial solutions for the management of human activities in a way that is compatible with the achievement of good environmental status (GES) and the capacity of marine ecosystems to respond to human-induced changes’. Alternatively, a ‘strategy for the integrated management of land, water and living resources that promotes conservation and sustainable use in an equitable way’. Ecosystem services: the ‘benefits that humans derive from ecosystem functions, either directly or indirectly, including provisional, regulating, cultural and supporting services’. Good Environmental Status (GES): the ‘environmental status of marine waters where these provide ecologically diverse and dynamic oceans and seas which are clean, healthy and productive within their intrinsic conditions, and the use of the marine environment is at a level that is sustainable, thus safeguarding the potential for uses and activities by current and future generations’. Integrated coastal management (ICM): a ‘dynamic, multi-disciplinary and iterative process to promote sustainable management of coastal zones. It covers the full cycle of information collection, planning (in its broadest sense), decision-making, management and monitoring of implementation. ICZM uses the informed participation and co-operation of all stakeholders to assess the societal goals in a given coastal area, and to take actions towards meeting these objectives. It seeks, over the long-term, to balance environmental, economic, social, cultural and recreational objectives, all within the limits set by natural dynamics’. Also often referred to as Integrated Coastal Zone Management (ICZM). Integrated Maritime Policy (IMP): the European Union’s coherent approach to maritime issues, with increased coordination between different policy areas, focusing on issues that do not fall under a single sector-based policy e.g. Blue Growth and issues that require the coordination of different sectors and actors e.g. marine knowledge. The objective of the IMP is to support the sustainable development of seas and oceans and to develop coordinated, coherent and transparent decision-making in relation to the Union’s sectoral policies affecting the oceans, seas, islands, coastal and outermost regions and maritime sectors, including through sea-basin strategies or macro-regional strategies, whilst achieving good environmental status as set out in Directive 2008/56/EC. Macro-regional Strategy: a macro-regional strategy is an ‘integrated framework endorsed by the European Council, which may be supported by the European Structural and Investment Funds among others, to address common challenges faced by states in a defined geographical area. In this framework they benefit from strengthened cooperation contributing to achievement of economic, social and territorial cohesion’. Marine Strategy Framework Directive (MSFD): a European Directive that aims to achieve Good Environmental Status (GES) of European waters by the year 2020 and to ‘protect the resource base upon which marine-related economic and social activities depend. It contains the regulatory objective that biodiversity is maintained by 2020, as the cornerstone for achieving GES. The Directive was adopted in 2008 and it enshrines in a legislative framework the ecosystem approach to the management of human activities having an impact on the marine environment, integrating the concepts of environmental protection and sustainable use. Each Member State is required under the Directive to develop a strategy for its marine waters, to be reviewed every six years’. Maritime Spatial Planning (MSP): there are various definitions of MSP, starting with the definition provided by UNESCO: ‘a public process of analysing and allocating the spatial and temporal distribution of human activities in marine areas to achieve ecological, economic, and social objectives that are usually specified through a political process.’ The European Commission defines MSP as ‘a process by which the relevant Member State’s authorities analyse and organise human activities in marine areas to achieve ecological, economic and social objectives’ as outlined in the MSP Directive’. The IMP identifies maritime spatial planning as a ‘cross-cutting policy tool enabling public authorities and stakeholders to apply a coordinated, integrated and trans-boundary approach’. Sea Basin Strategy: a ‘structured framework of cooperation in relation to a given geographical area, developed by Union institutions, Member States, their regions and where appropriate third countries sharing a sea basin; a sea basin strategy takes into account the geographic, climatic, economic and political specificities of the sea basin’. Strategic Environmental Assessment (SEA): the ‘process by which environmental considerations are required to be fully integrated into the preparation of Plans and Programmes and prior to their final adoption. The SEA requires the environmental authorities to be consulted at the screening stage; scoping and it requires an assessment of reasonable alternatives and the Member States must monitor the significant environmental effects of the implementation of plans / programmes in order to identify unforeseen adverse effects and undertake appropriate remedial action’. 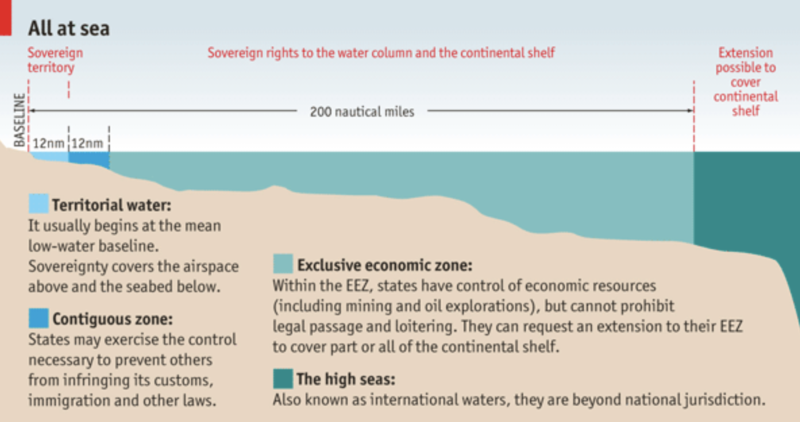 UNCLOS: An international treaty that ‘provides a regulatory framework for the use of the world’s seas and oceans, inter alia, to ensure the conservation and equitable usage of resources and the marine environment and to ensure the protection and preservation of the living resources of the sea. It was adopted in 1982 and entered into force in 1994’. Costanza, R., d’Arge, R., de Groot, R. S., Farber, S., Grasso, M., Hannon, B., Limburg, K., Naeem, S., O’Neill, R. V., Paruelo, J., Raskin, R. G., Sutton, P. and van den Belt, M. (1997), The value of the world’s ecosystem services and natural capital, Nature, 387(6630): 253–260. Alcamo, J., Bennett, E. M., & Millennium Ecosystem Assessment (Program). (2003). Ecosystems and human well-being: A framework for assessment. Washington, DC: Island Press. 30 Definition adapted from: European Commission Directorate-General for Regional Policy (2011). „European Territorial Cooperation: Building Bridges between People“.